Summerfest attracts thousands every summer, but it can be a hassle to park and even drive there. But this summer, the Milwaukee County Transit System will be shuttling people to and from the "World's Largest Music Festival." 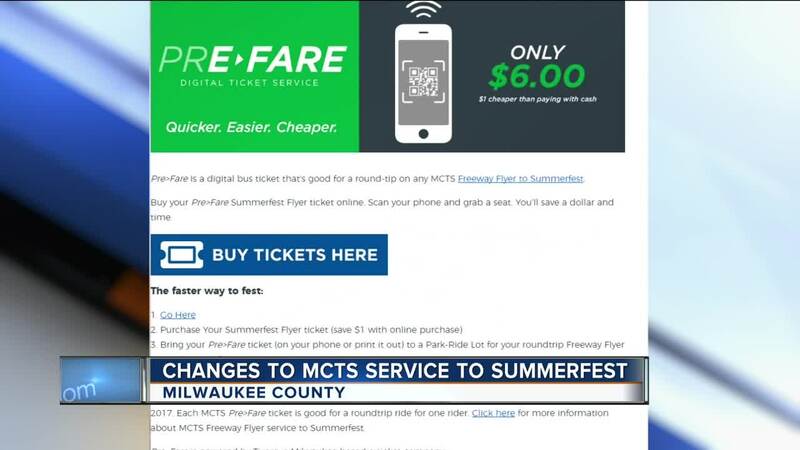 All throughout Summerfest's run, MCTS will have Freeway Flyers, downtown shuttle and local bus routes to fulfill your travel needs. The only thing you need to do differently is if you plan on using the Freeway Flyer routes. In order to speed up the boarding process, riders will need to buy their roundtrip tickets beforehand and receive a wristband when they get off the bus at Summerfest. You can purchase a digital ticket ahead of time at RideMCTS.com . On the bus riders can use their M-Card or pay with cash or credit card. The wristband is required to get back on the bus. Riders without a wristband will be able to buy one for their return trip by paying the full fare. The downtown shuttle will run from 11:30 a.m. until 12:30 a.m. and will drop off guests directly at the North Gate of the grounds. The shuttle runs down Wisconsin Avenue to 10th Street and back with stops at nearly every block. Riders can pay with cash or M-Card, or through the Ride MCTS App. Local routes will drop off guests near the Summerfest gates as well. Riders can take routes 14, 15, GreenLine and GoldLine, which all drop off within walking distance of the Summerfest Grounds. Plan your trip at RideMCTS.com or by using the Ride MCTS app. If you decide to drive to the Big Gig, there are a couple routes affected by the new Milwaukee Streetcar. For more information about routes to Summerfest, check out their Traffic Impact Map. For all of your Summerfest traffic and parking needs, as well as bus and shuttle information for local bars and restaurants, visit the Summerfest website. MCTS will also be shuttling for the Wisconsin State Fair, PrideFest, Polish Fest, Festa Italiana, German Fest, Irish Fest, Mexican Fiesta and Indian Fest.